By Scott Gilfoid: Ricky Hatton (45-2, 32 KO’s) is rumored to be taking on tough lightweight contender Michael Kataidis (28-6, 23 KO’s) for his comeback fight on November 24th at the Manchester Arena (formerly M.E.N Arena), Manchester, Lancashire, United Kingdom. It’s still not confirmed as of yet, so it’s possible the 33-year-old Hatton may opt for a nice soft target against a 3rd opponent and not Katsidis. However, if Hatton does face Katsidis on November 24th, I think it’ll be the biggest mistake since his decision to fight Manny Pacquiao in 2009. Katsidis, 32, will likely be asked to move up two divisions to fight Hatton at welterweight for this comeback fight, because it’s highly doubtful that Hatton can burn off enough weight to get back down to old weight of 140. I think the days of him fighting at light welterweight are history. So that in itself will give Hatton a giant edge in his favor against Katsidis, who doesn’t have the size to fight at light welterweight even. By fighting a guy that is way out of his size range, Hatton might have enough of an edge to actually win the fight. But I don’t think this will be enough. Katsidis is like a mini version of Hatton, only he’s not let himself go in the last three years the way that Hatton has. Katsidis always stays in top shape and doesn’t let himself balloon up in weight the way that Hatton has in the past three years. The 5’7″ Hatton will has had to take off a massive amount of weight for this comeback and that’s probably going to hurt him in a major way if he can’t get Katsidis out in the first five rounds. The fight is scheduled for 10 rounds, and Katsidis will be able to work over a tired and worn out Hatton in the last five rounds of the fight. The fight is taking place in the UK, so you got to expect that Hatton will be able to get away with a ton of grappling on the inside to waste time and keep Katsidis from getting his shots off. However, Katsidis is an excellent inside fighter, and if Hatton tries to keep the fight in close, he’s going to be dealing with a lot of body shots from Katsidis. Getting hit with body shots when you’ve inactive like Hatton has been could be enough to wear him down quickly. Hatton has probably taken off between 40 to 60 pounds of fat for this fight, possibly even more, and when a fighter takes that kind of blubber off, they’re not the same in terms of strength and stamina. 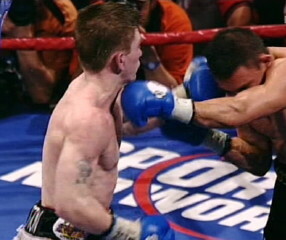 Hatton will probably try and tie Katsidis up all night long like Hatton did in his fight agaisnt Kostya Tszyu. Once Hatton starts getting hit with hard shots, he’ll likely start with the inside grappling to keep Katsidis under control. Since the fight is taking place in Manchester, England, Hatton will likely be able to wrestle all night without having to worry about a pesky referee pulling him off of Katsidis to force him to fight in a normal manner.